Everyone laughed when news leaked of a possible Lifetime movie starring Will Ferrell and Kristen Wiig, then everyone was disappointed when it was reported that the rumoured project was cancelled because of the leak. Well the joke was on us, as the comedy duo are starring in their very own cheesy TV movie, A Deadly Adoption. So great PR all around. In this slice of guilty pleasure, the pair star as a successful couple who take in a pregnant woman (Jessica Lowndes) in her final months of pregnancy, hoping to adopt her unborn child. From the film's title, you can guess things don't go to plan in this dramatic thriller. 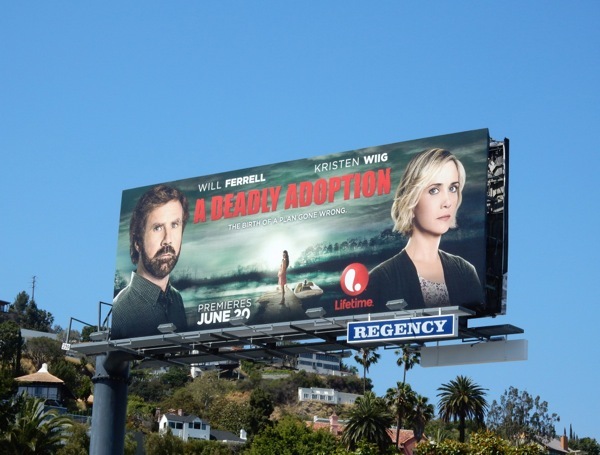 These deadly serious billboards were snapped along L.A. Sunset Plaza on June 5, 2015 and above San Vicente Boulevard two days later. If you're an admirer of Kristen Wiig you can also enjoy these Bridesmaids movie billboards, whilst Will Ferrell fans can check out these fun Get Hard movie billboards, Anchorman 2 movie billboards and film billboards for The Campaign. You know you want to watch this movie, no matter how bad /good it is.